So there were lots of complaints that my contest last year for the Marq Spusta signed Dogfish Head beer labels was "just a little too tough". Boo Hoo. I guarantee that the winners didn't spend more than 10-15 minutes coming up with their answers. There were even multiple answers to every question. AND all the contestants that made a solid effort got the prize, though they did not know that would be the case in advance. I'm not saying that will be how it works for this one or future contests either, as it will totally depend on how many prizes I have and entries are received. Anyway, this year's Dogfish Head Seasonal beer artist is Tara McPherson. And the four ladies she did are spectacular. So far we have Audrey Aprihop and Anabella Peche, with the Fall and Winter girls' pictures available but names TOP SECRET. If you find out their names, feel free to whisper them to me. 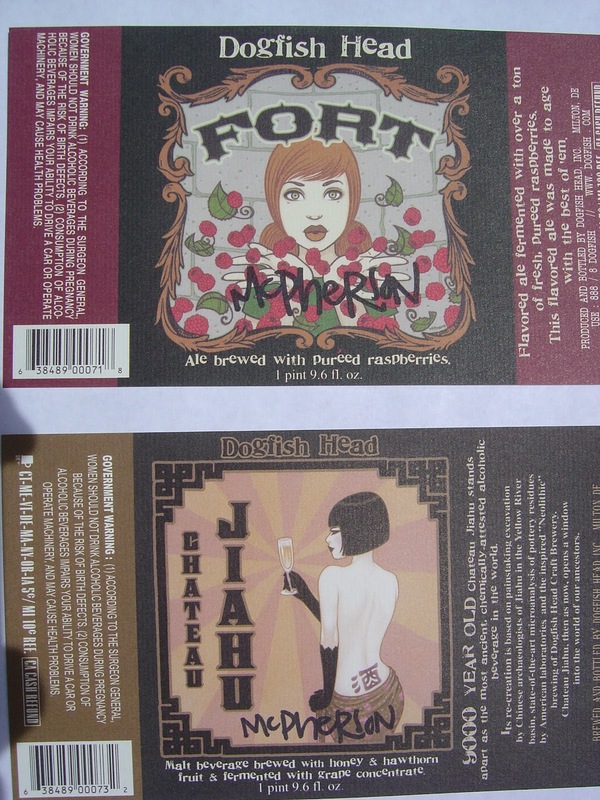 Tara did two prior labels for Dogfish: Fort and Chateau Jiahu, and both are awesome. I asked Tara if she would sign some of them for me and she agreed. How cool is that? So here is the prize, a pair of autographed labels! There will likely be multiple winners, but that depends on you guys, and I'm not sure how many "multiple" means yet. Anyway, you probably thought this was going to be simple, but hey, this is a prize you will not find anywhere else. It's not an iPod or a $50 gift card or a kitchen knife, but it is certainly unique. Keep it and tell your kids about it. I predict collector's items with Tara (and Spusta too, if you got those). You must follow instructions here. If you don't pay attention, your entry will be ignored. It's not hard. It's attention to detail. The best answers (based on facts and creativity), judged by me, win the prize(s). Email me your answers to dailybeerreview@yahoo.com with the subject line "Tara McPherson Label Contest" by Sunday, June 17, 2012 at 10 pm Eastern. I'll pick the winners shortly after that. Don't forget to show me the links where you found supporting evidence for your answers. Here's a hint. You will need this website to find many of the answers (the search box top right is your friend). 1. Name two other spirits that I might quit beer for. Be sure to show me why you believe that. 2. Name three foreign beers I've tried (must be from three different countries too). 3. Name four South Florida Breweries. Have you ever had any of their beers? Yes? Which? Describe your experience with one of them. No? What is your #1 choice if you could have any delivered tonight and why? 4. Find one picture from the website and tell me why you think it's awesome or why you think it's horrible. No middle-of-the-road wishy-washy answers. 5. If you have a choice of buying two bombers of Shipyard XXXX IPA for a party, each priced at $8.99 OR a 4-Pack of 12 ounce bottles of Shipyard XXXX IPA priced at $8.99, what do you buy and why? 6. Bonus. You must answer #6 no matter what, but if the answer is really good, it can make up for a wrong or incomplete or stupid answer in the first 5 questions. In a few sentences, offer some advice for this website. For the record, I awarded the prize to all three entrants that completed the answers. Thanks.